A mid-sized wild cat of Central and South America, Jaguarundi is an interesting feline. It is unlike any other cat in its appearance, resembling an otter, with its small head, short rounded ear, elongated body and tail supported by small legs. Rightly, it has often been called 'Otter cat'. It may weigh from six to twenty pounds and is around forty inches long - excluding a twenty inch tail. Unlike most other felines, the Jaguarundi, Puma Yaguarondi, has a completely uniformly colored coat. Cubs are spotted at birth like those of lions, but with time the spots disappear to give a coloration ranging from grayish brown to red. Previously the color variations were attributed to unique species of this cat - but now it is understood that they are a normal trait of the Jaguarundi - with different colored cubs found in the same litter. 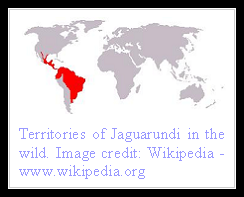 Genetically the Jaguarundi resembles the Jaguar and the Cougar, with a similar chromosomal number. 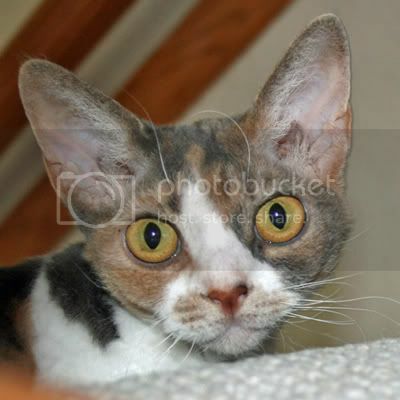 Though highly adaptable, the natural habitat of this wild cat is dense forest and shrub area. It is an adept fish hunter and is usually found near water courses. Birds are frequently preyed upon, as are rodents, small reptiles, frog and domestic poultry - something that often brings conflict with farmers. It's a good tree climber and a diurnal hunter. 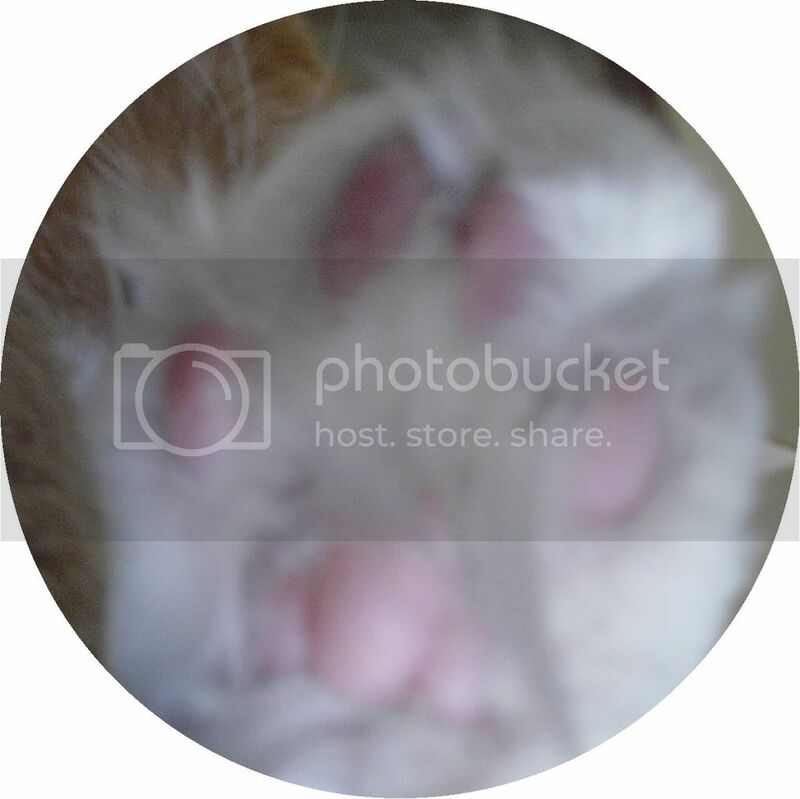 The predatory profile varies according to habitat as does its color - with paler variations found more in dry open areas and darker color seen in cats living in thickly forested parts. Predominantly found in Mexico and South America, Jaguarundi has been seen in Texas, New Mexico and Florida. Various subspecies are recognized - based upon geographical distribution. Predominantly a solitary predator, Jaguarundi may be seen to travel in pairs or come together in bringing up of the young. The average litter size is one to four, born after a pregnancy lasting for nearly two and a half months. The young are introduced to regular food at six weeks and gain maturity at around two years. In captivity Jaguarundi has been known to live for up to fifteen years. In the wild the Jaguarundi is seldom sought for its fur - something that's fortunately not in high demand amongst traders. The primary danger to this unique wild cat is through deforestation and habitat destruction - largely due to human intervention in nature! Those are beautiful cats! Thank you for sharing some information about them with us. 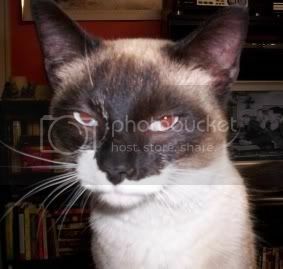 That am a furry mean lookin' kitty. Worser than Rascal when he's got a grump on, hee hee. I 'specially like yur map. 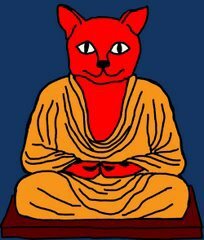 We've been interested in Otters ever since we saw the movie Ring of Bright Water/ Interesting that there is a cat who resembles one. 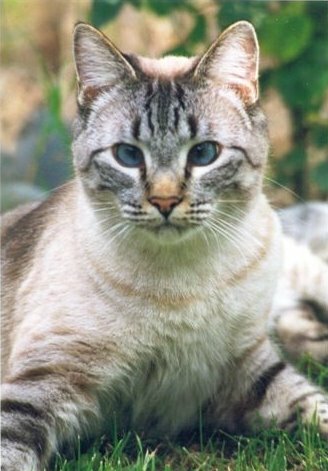 Wow, that is a very, very unique looking cat. 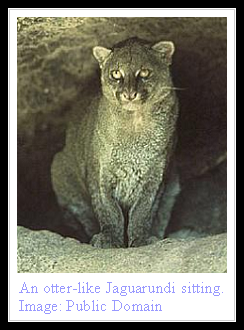 That is fascinating to lean about the Jaguarundi. Wowie, those are beeyootiful cats! So kool to learn about 'em. Thankies fur your informative posties! Wow, what wonderful kitties! Thank you for teaching us about them! Your blog is so fascinating. Oh cool! Maw went on a wildlife research expedition to Mexico to help a doctoral student trap, collar and track jaguarundi, coatmundi, and ocelot. They trapped one jaguarundi while she was there and collared it, and tracked several others. It was really exciting. Except for the ticks. Quote "The primary danger to this unique wild cat is through deforestation and habitat destruction - largely due to human intervention in nature!" Sad thing is ,the deforestation will also become a primary danger to humans over time. The maid LOVES the Jaguarundi! The Arizona-Sonora Desert Museum here in Tucson has a couple of them, and that is where she saw them! Beautiful! So many types of cats. I didn't know there were so many. I was glad to see the Jaguarundi don't live anywhere near me, as I think they would be too fierce. I have enough trouble with the other cats around here already. I don't think you'd want to back him into a corner. Glad to see you found some more cats. I've read about this one. The picture was different though, kind of striped coat on the one I saw. You had a little more to say than what I read. It's so interesting to know there are so many types of cats out there besides our beloved ones. Why do people get so serious about just reading this article? The only cats which are capable of roaring are those of the genus Panthera, the tiger, lion, jaguar and leopard. Part of the hyoid apparatus in their throats is made of cartilage rather than bone, which allows them to roar. They are sometimes described as 'the roaring cats' for this reason. i luvv jaguraundi i never heard of them before till i started a project on them i luvv this otter-cats now!!!!!!!!!!! Have seen these in n tx never had problems w them around sheep. Beautiful. Wow! The breed looks great!